What do I need to check Internet before setting up my Linksys router? Before setting up your Linksys router, make sure that your computer has active Internet connection. You can do this by connecting your computer to the modem using an Ethernet cable and try browsing any website. If you cannot access the Internet, contact your Internet Service Provider (ISP). You can also contact them if you are uncertain about the type of Internet connection you have. The Linksys router comes with a Setup CD for easy installation. The software will automatically detect the type of Internet connection from your ISP. Simply insert the Setup CD that comes with the device to your computer’s CD drive and follow the on-screen instructions. If you lost the Setup CD, you may download the software from the Linksys Support Site. Manual configuration of your Linksys router is recommended if the Setup CD failed to set up your router. Follow the instructions below to manually set up your router. Connect the computer to one of the Ethernet ports on the router using an Ethernet cable. Plug in the router’s power adapter to a power source and connect the other end to the power port of the router. If your router has a power switch, turn it ON. Observe the power light of your router until it becomes stable. This type of router configuration is ideal for connecting to a modem which is set to Bridge Mode. This means you need to have a PPPoE dialer set up on a computer or router to establish Internet connectivity. Access the router’s web-based setup page by entering 192.168.1.1 in your browser’s Address bar. Once you get a login prompt, leave the username blank and enter “admin” for the password. If you changed the login details, use those details instead. On the Setup tab, click the drop-down arrow for Internet Connection Type then, select PPPoE. Enter the PPPoE Username and the Password provided by your ISP. Select Keep Alive and click on the Save Settings button at the bottom of the page. Click on the Connect button if the Login Status is Disconnected. If the Internet IP Address and DNS servers show zeroes (0), you need to restart the router to obtain the correct values. Restarting is done by unplugging the power adapter of the router for 30 seconds then plugging it back in. IMPORTANT: When the router is set up for a PPPoE connection, PPPoE dialers that have been configured on your computers must be disabled. Click here to learn how. This type of router configuration is ideal for connecting to a modem in Automatic Configuration- DHCP Mode. Having your modem and router operate as DHCP servers under the same network may cause IP Addressing conflicts. To prevent this issue, you can change the router’s IP Address range. NOTE: Make sure the modem is not connected to the router while doing the following steps. Otherwise, you might end up accessing the modem’s web-based setup page. On the Internet Setup section, click the drop-down arrow for Internet Connection Type then select Automatic Configuration – DHCP. 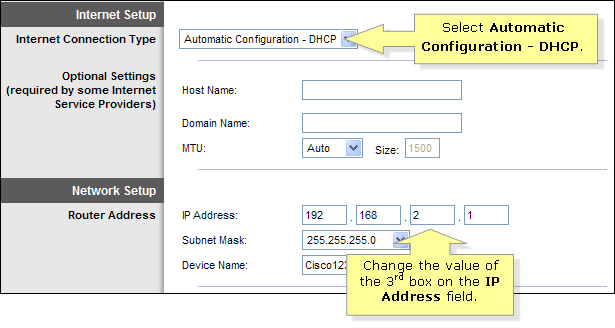 Change the value of the third box in the IP Address field. The Subnet Mask should be 255.255.255.0. In this example, the IP Address used is 192.168.2.1. Click Save Settings and close the router’s web-based setup page. On your computer, open the command prompt then type “ipconfig/release” then press [Enter]. Then type “ipconfig/renew” and press [Enter] again to refresh the computer’s IP Address. Remember to use the new IP Address of your router (192.168.2.1) the next time you access the router’s web-based setup page. Now that you have configured the settings of the router, you can connect the modem to the Internet port of the router using an Ethernet cable. You should now have successfully set up your Linksys router with DSL Internet connection. To learn how to connect other computers and devices to your router, click here.